Bill – Page 2 – Where in the World are Cindy and Bill? 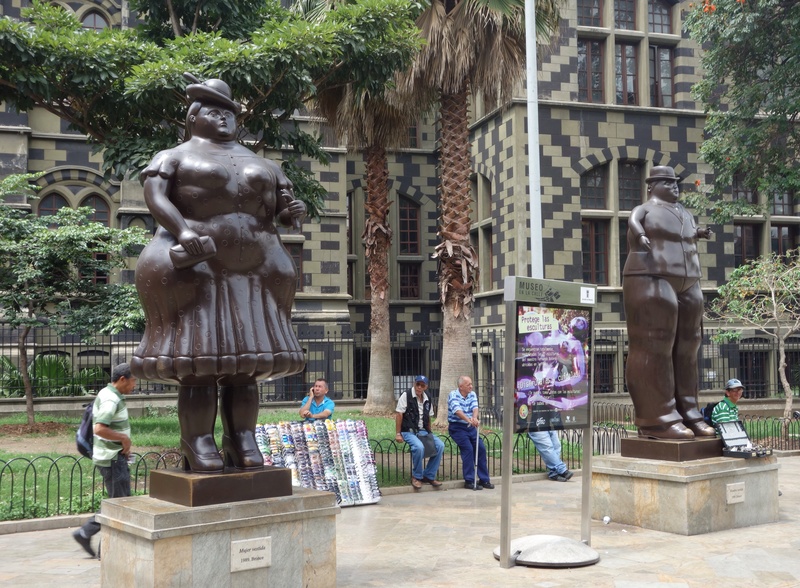 While in Medellin, we focused on touring the city and going to school but we did take some time to see some sights out of town. 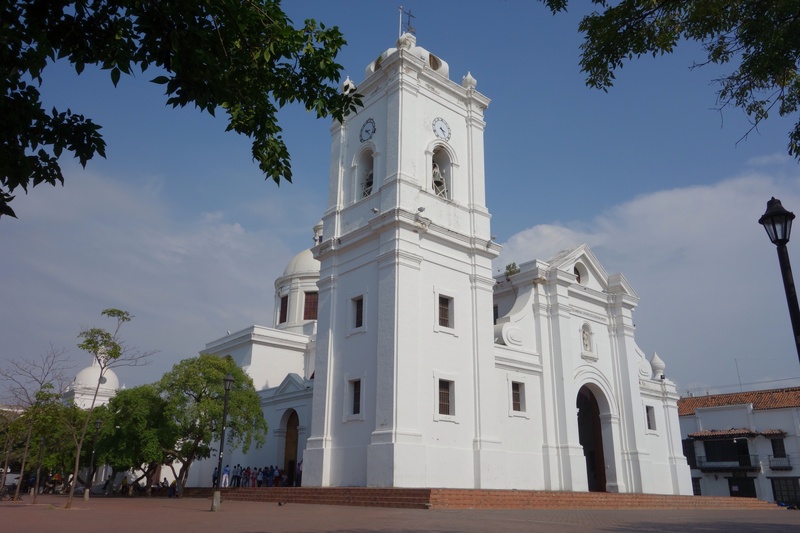 We went to Santa Fe de Antioquia, also known as The Mother City. 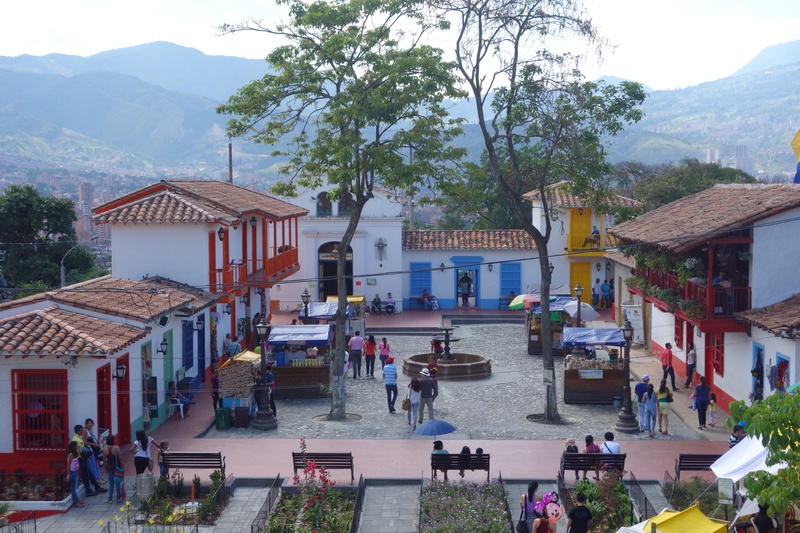 It was founded in 1541 and was the regional capital until the government moved to Medellin in 1826. 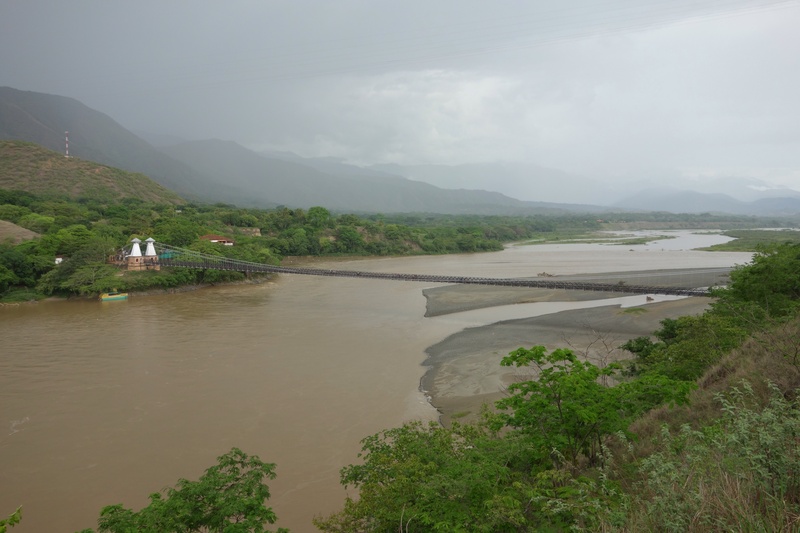 The historic Bridge of the West is a National Monument which spans the Cauca River. Below is a photo of a photo taken during a Catholic religious ceremony in Santa Fe. 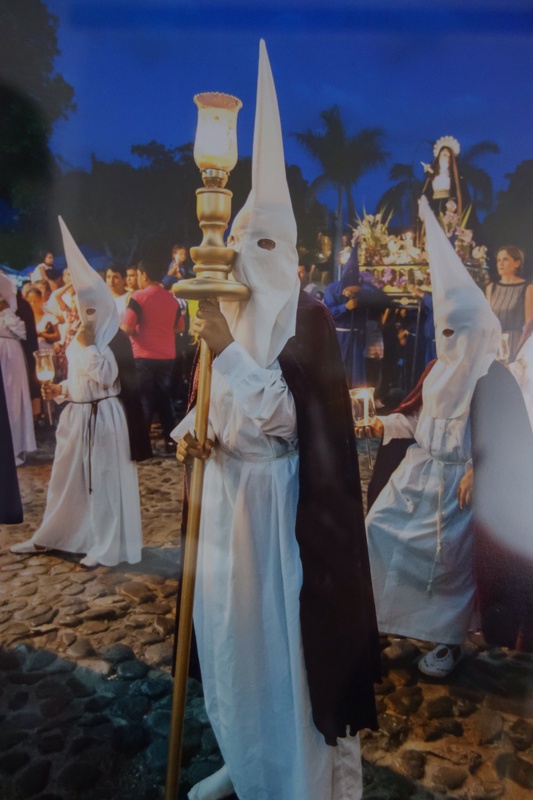 I wasn’t able to find out the significance of the hoods (perhaps they are supposed to represent angels) but it highlights the differences in cultural meanings. 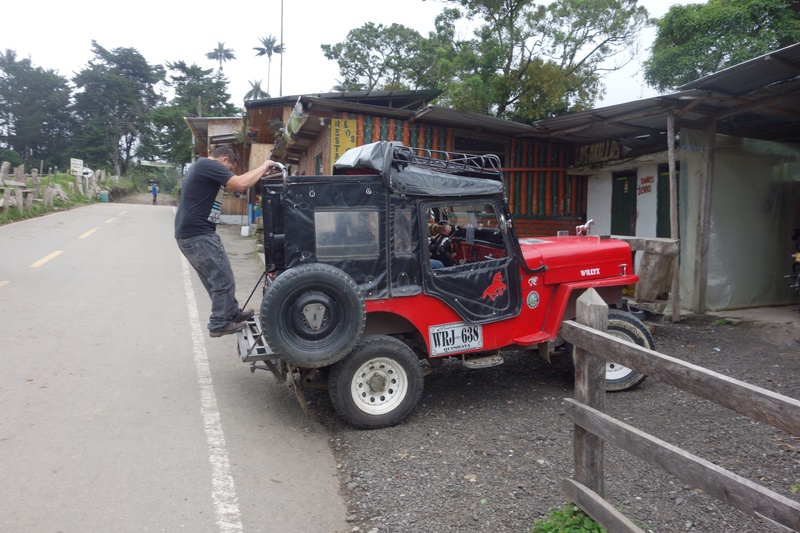 We had wanted to go to a beautiful area called Zona Cafetera (the main coffee growing region) since we first heard about it. 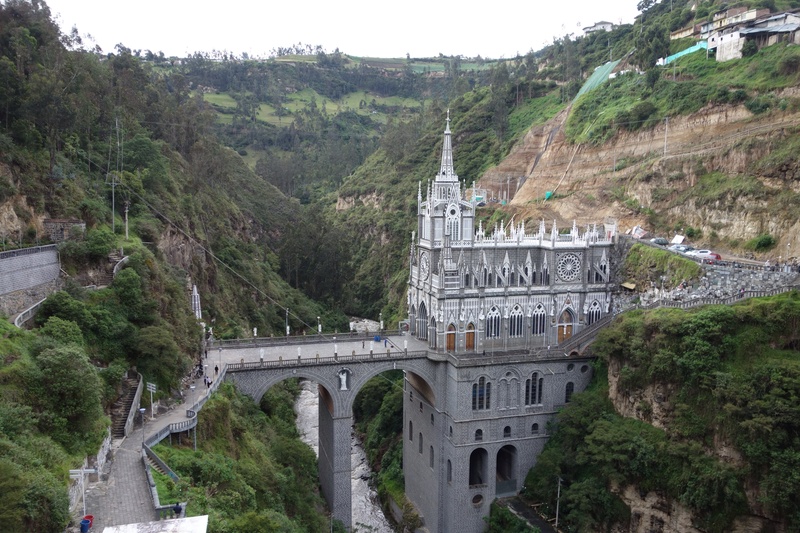 It was close to Medellin, but not close enough for a day trip. Knowing this would probably be our last chance, we woke up on the Monday of our last week in Medellin and decided to play hooky from school (there was a holiday during that week anyway). That was at about 8:00am. We ate breakfast, packed some things and were out the door minutes later. We grabbed a taxi that had just dropped someone off and headed for the south bus terminal. Once there, the search was on to find the window of the transportation company that sold tickets to Pereira. It took a few minutes until we found the right one among the dozens that were lined up one after another. When I asked what time the colectivo (a shared taxi/minibus) would leave, the woman at the counter told me 9:30. As I looked up at the clock it was indeed 9:30! We paid for the tickets, went right out to the gate and at 9:37 we were on a colectivo heading for Pereira, one of the major cities in Zona Cafetera. 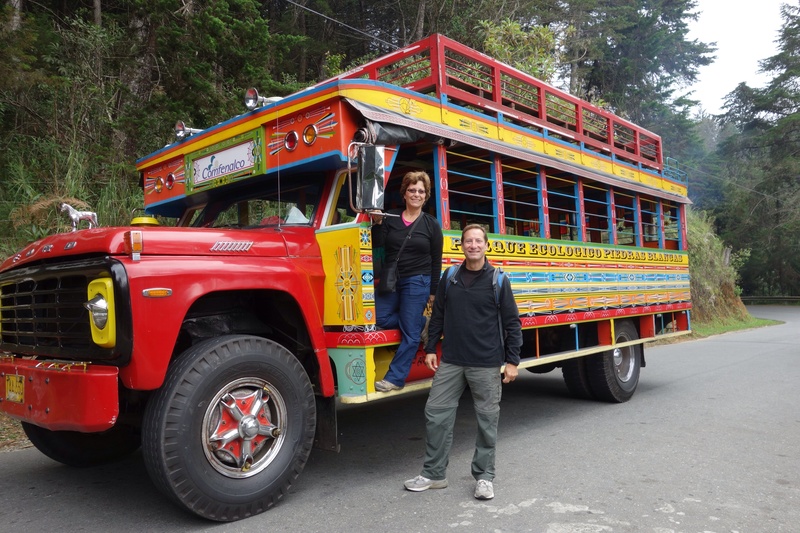 It was a 5 hour ride including a stop for lunch, and once there, we had to find another colectivo to our destination, Salento. I quickly found the right transportation company and while waiting for our next colectivo, I called a hostel and made a reservation for the next few nights. 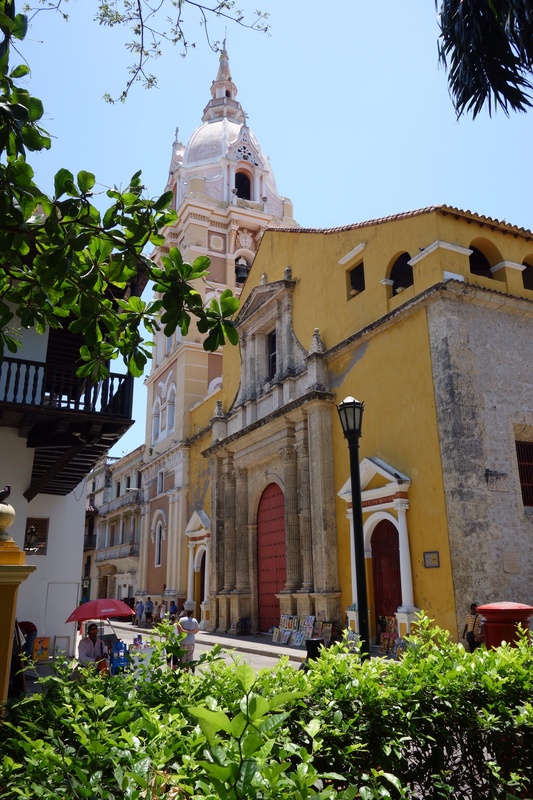 We boarded another colectivo and in less than 1 hour we had arrived in Salento. We stayed in the Plantation House Hostel owned by an Australian ex-pat who also owned a local coffee farm. His name was “Tim” but that didn’t sound too Colombian so he changed it to “Don Eduardo”. 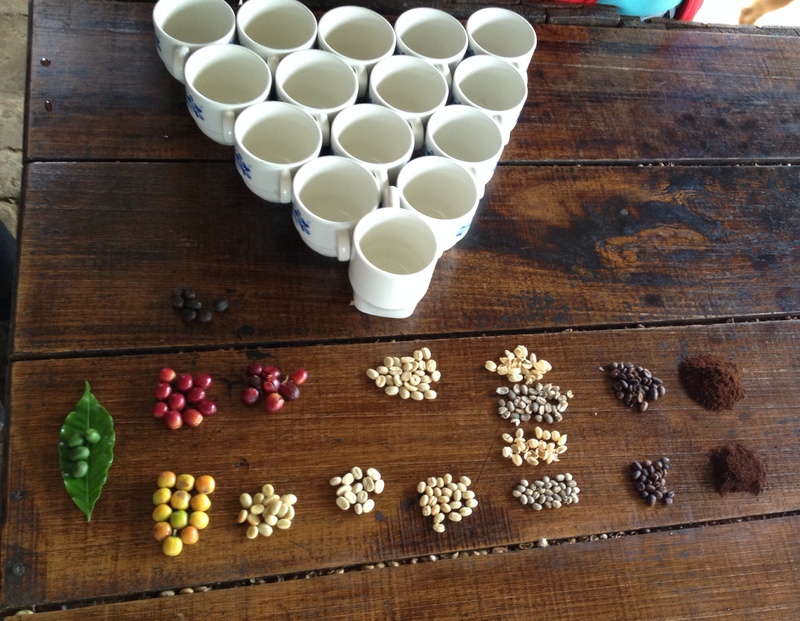 The tour was excellent, covering the coffee growing and processing business from A to Z. After the tour we got to sample a couple of different kinds of coffee. 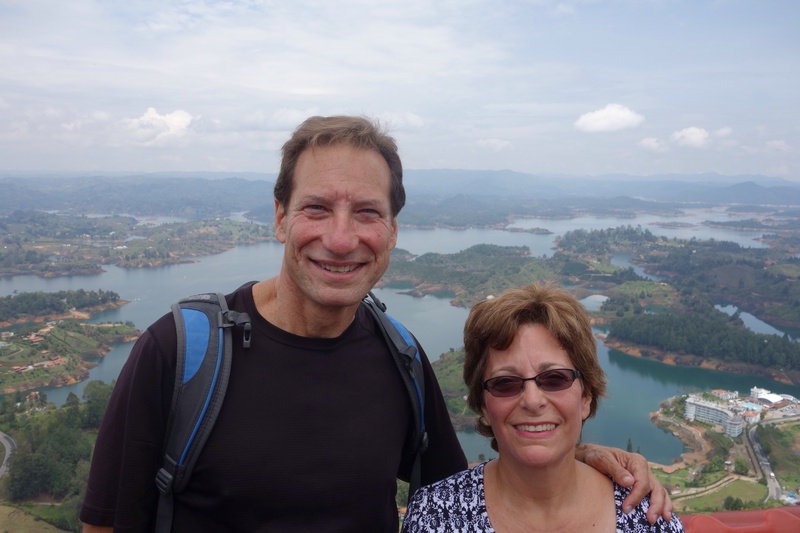 The next day we did a 5-hour hike to The Acaime Nature Reserve in the Cauca Valley. 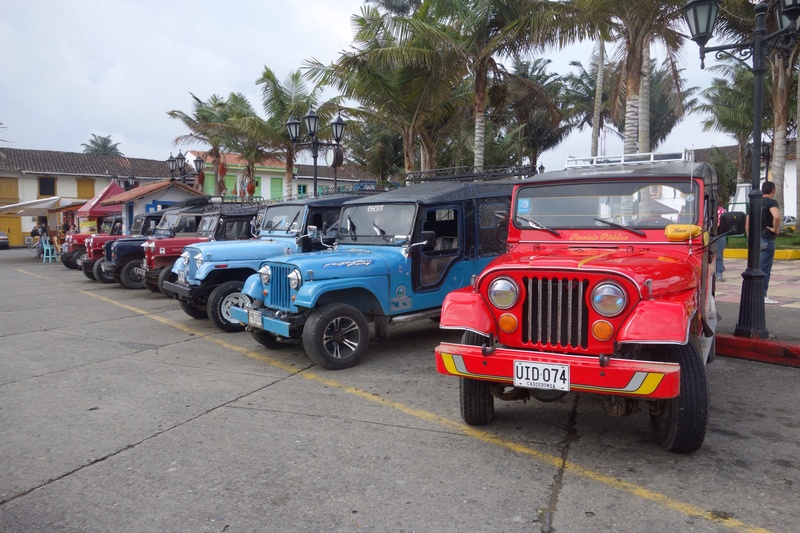 To get there, we went to the center of town where there is a cadre of old Willys jeeps that shuttle people to the village of Cocora. The first part of the trail goes through farmland and is lined by a barbed wire fence. 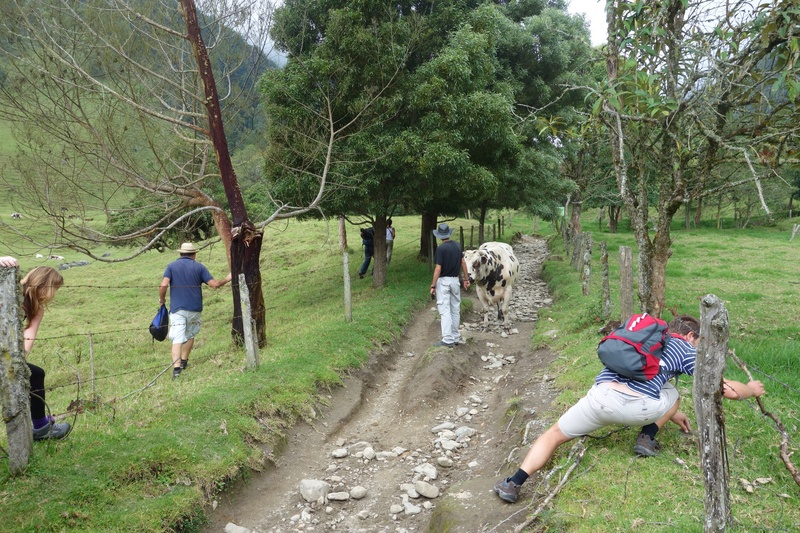 After about 20-25 minutes, there was a most unusual obstacle blocking the trail. A farmer stood guard over one of the biggest bulls I’d ever seen and it was smack dab in the middle of the trail. There was no negotiating this situation. The farmer recommended everyone go around the bull by going over/under/through the barbed wire enclosure. So we all did. That night I went to a local bar/restaurant to play one of the national games of Colombia called Tejo. Tejo involves throwing 2-kg metal discs into a pit containing gunpowder-filled paper charges with the objective of hitting them so they explode. I played with a couple from the hike and some others they had met in their travels. Drinking beer and shouting are obligatory. It was great fun! 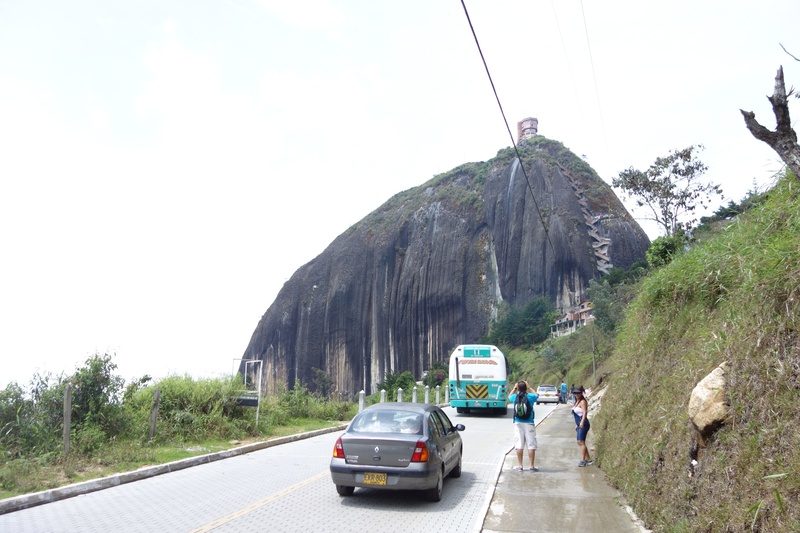 On one weekend excursion out of Medellin, we stopped at La Piedra (The Rock) Del Peñol on the way to the town of Guatape. La Piedra is a unique geologic formation with a rock face that is over 200 meters high. 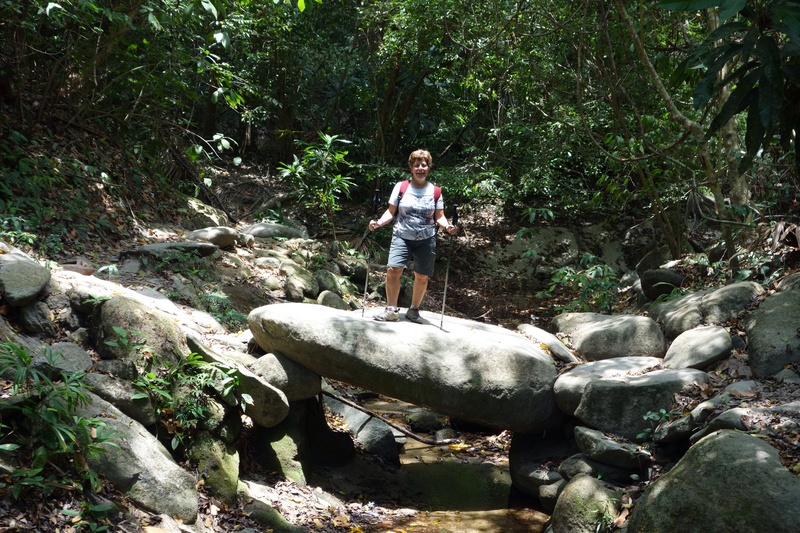 Climbing to the platformed summit involves ascending 740 steps built into one of the rock’s breaks. 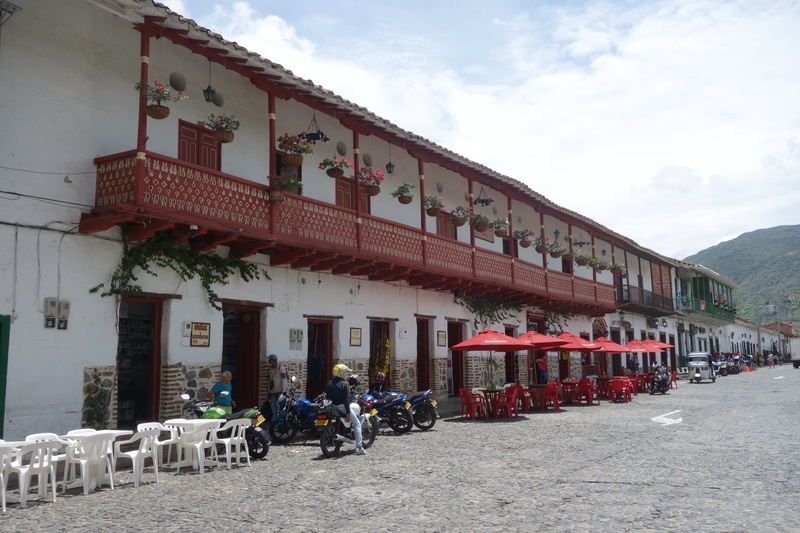 The town of Guatape was originally built in 1811. 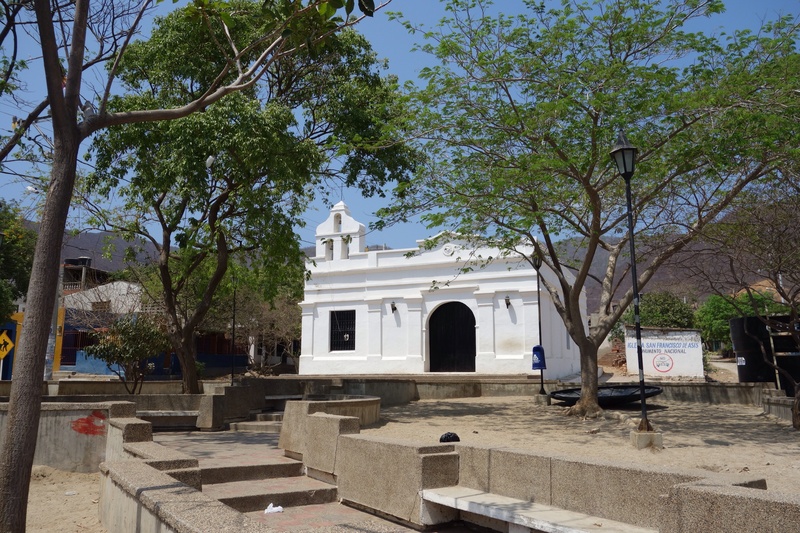 A virtual ghost town at one time, it metamorphosed into a tourist town a few years ago. 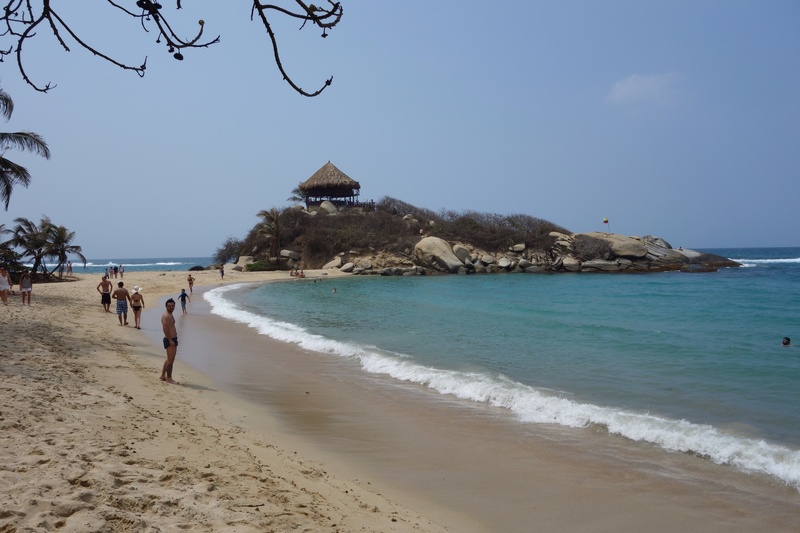 Most of the tourists appeared to be weekend-tripping Colombians. 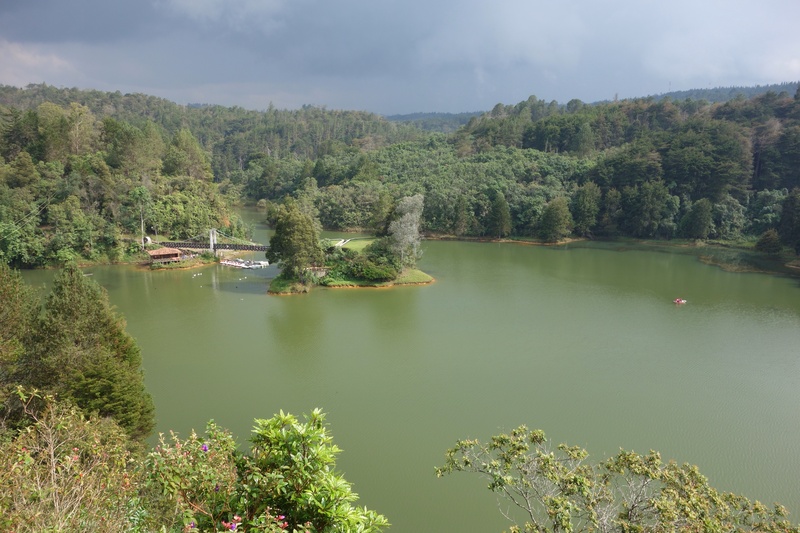 The summit provides a sweet 360 degree view of lakes and hills which were dramatically altered when much of the area was covered by water due to construction of a hydroelectric dam in the 60’s. 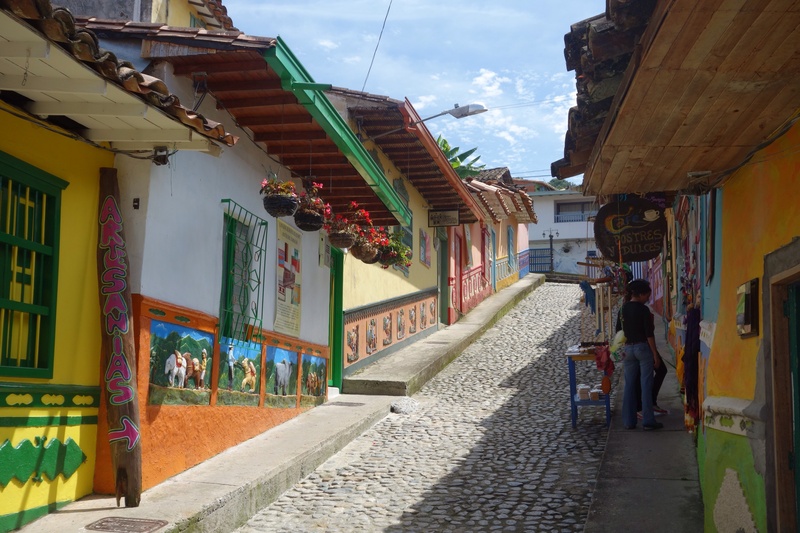 We took a short cab ride to the charming town of Guatape where we strolled the narrow cobblestone streets whose houses were lined with colorful frescos. 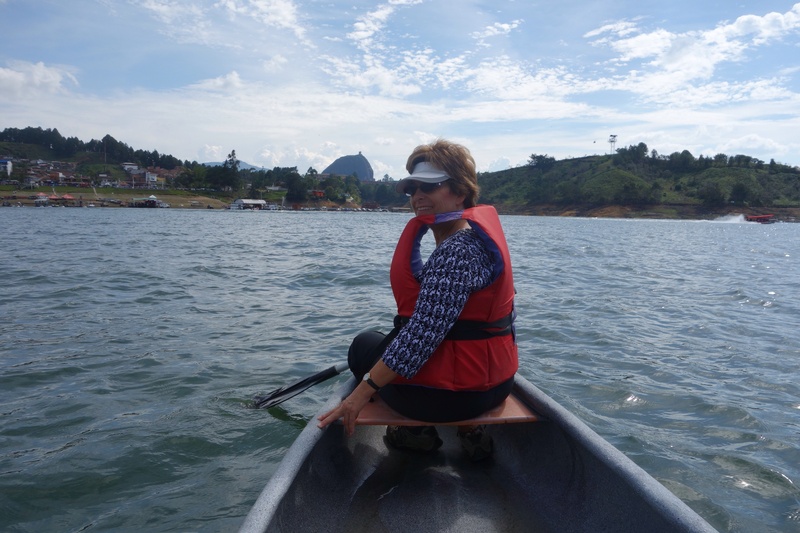 We dined on local paisa dishes and took a canoe out for a ride on the lake. Every morning I walk outside and the weather feels the same. 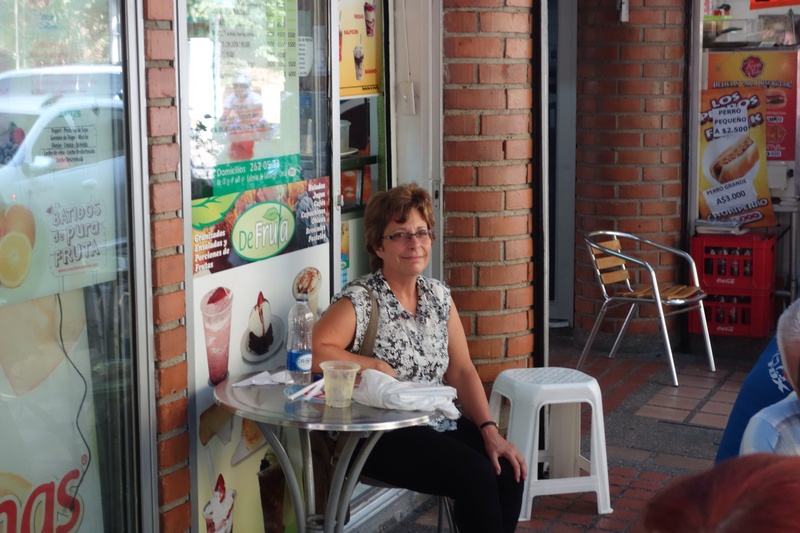 Short sleeves and about 75 very comfortable degrees……..every day. Medellin is known as La Ciudad de la Eterna Primavera or The City of Eternal Spring. 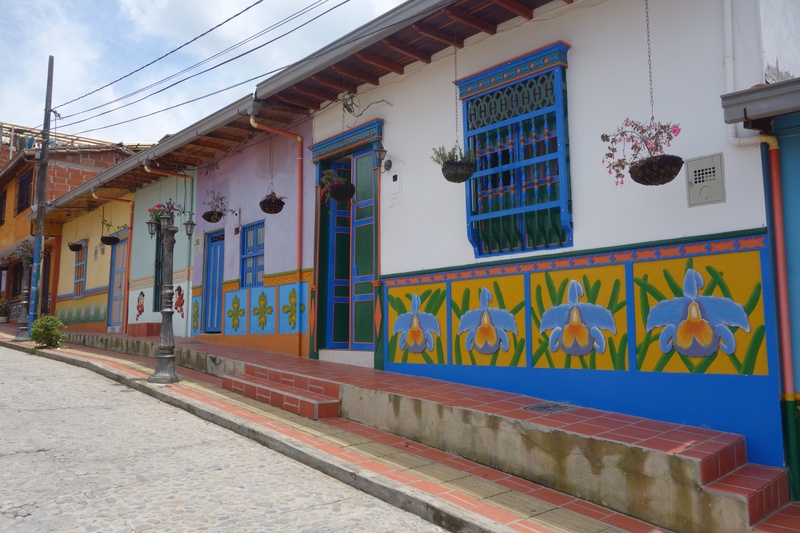 The friendly, warm and courteous local people are called “Paisas” or Antioqueños after the larger Colombian region of Antioquia in which Medellin resides. 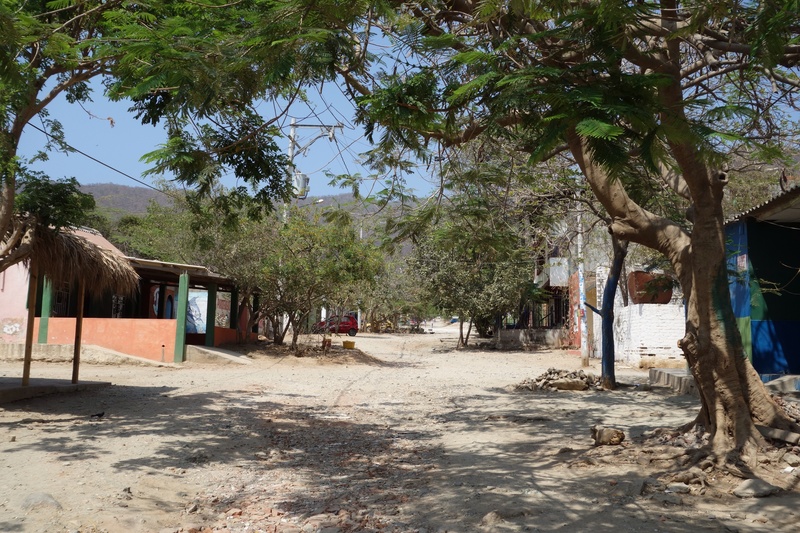 It’s clear the residents have a lot of pride in their city and make efforts to keep it clean and hospitable. 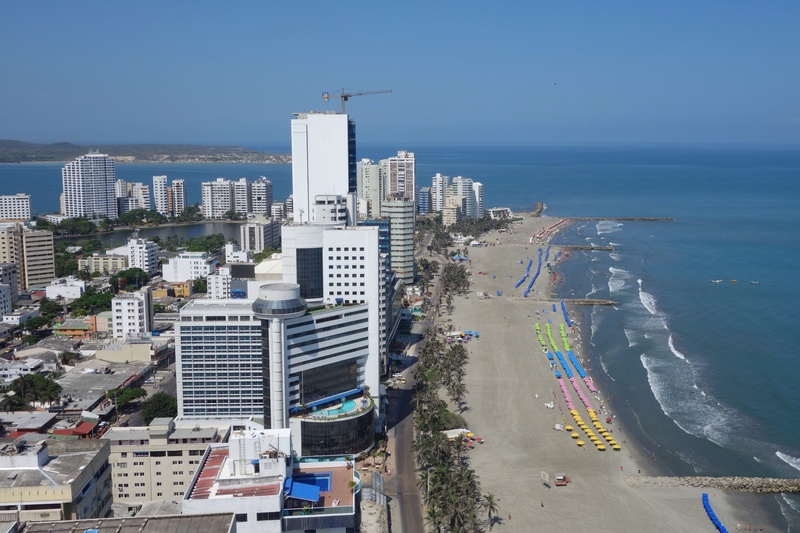 Although this is a city of 2.4 million people, it’s not unusual for people to express a daily greeting like, “buenas tardes”, along with a broad smile. Paisas are very straight forward and direct. Unlike many other cities, there is very little to fear about getting ripped off simply because you’re a tourist and automatically a target. 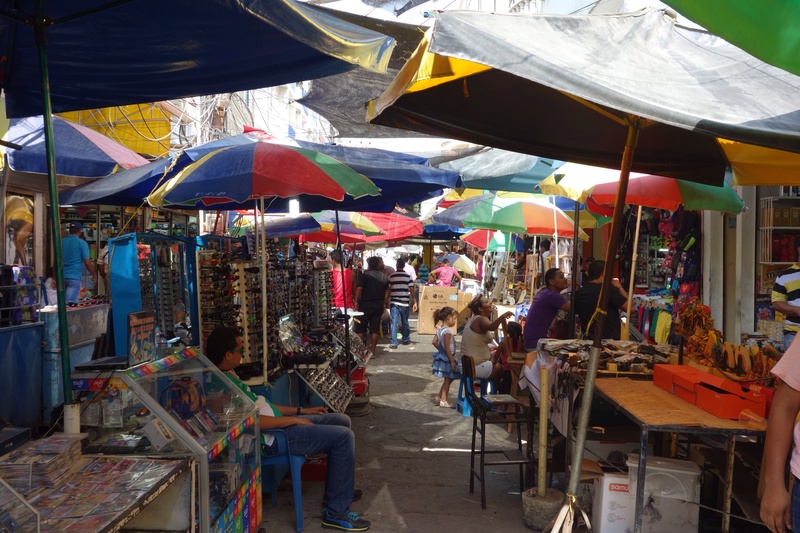 Given its reputation from the 80’s as the second most dangerous city in the world, Medellin would surprise many people at home as to how safe and “everyday” pleasant it feels with its supermarkets and shopping malls. As social norms go, there are some things that just are or are not done. For example, although it can get warm here, its unusual to find people dressed in shorts. I’d estimate that 70% of the people in the city regularly wear blue jeans. The men dress casual and are always neat and presentable. The women are impeccably put together without a hair out of place. The only clothes I have are quick-dry t-shirts and pants making it very easy to spot the gringo in the crowd. I wondered if I’d blend in if I put on a plaid shirt and jeans. Cindy assured me that I would not. I often see high-end road bikes around the city ridden by cyclists dressed in matching regalia as they do back home. 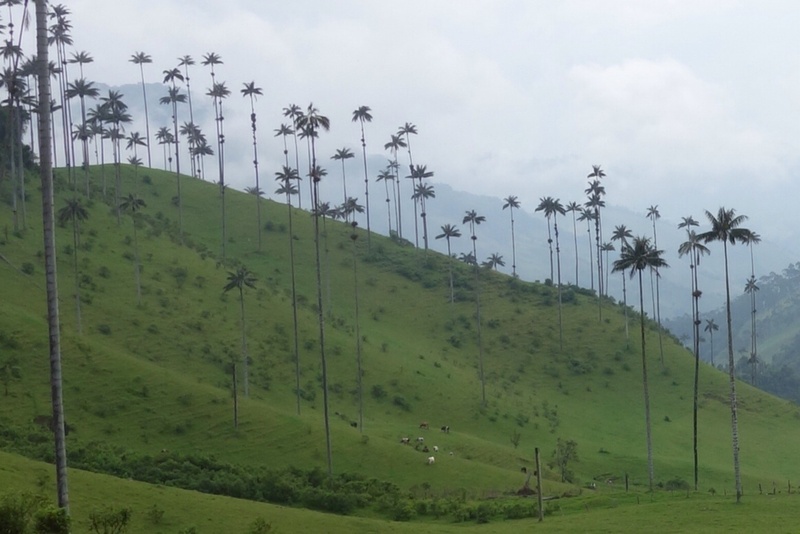 Although Colombia is a relatively poor country, there is a visible population with high disposable incomes. One of the aspects of ‘life in the big city’ here is that drivers have the right of way and they exercise that right at most times. Not that anyone would intentionally hit you but cars and especially motorbikes go very fast. The general guideline is that the larger vehicle has the right of way so pedestrians rank quite low. Often traffic lights are pitched only towards drivers’ view making it difficult for pedestrians to know when it’s safe to cross the street. I went for a long walk on my own one day unfortunately forgetting my cell phone which I have specifically for situations like this. I didn’t have a map either. So, when I got ‘lost’ and had to ask for directions, it was a game of language survival skills to get back to home base. I thought this was kind of cool. I stopped and asked a gentleman for directions to the metro. I got the drift of what he said but he had also used a term twice that I didn’t understand. He used the word “derecho” (straight ahead) which I took for “derecha” which means “right”. The word came up again with another person I asked after traveling down the street a ways. Then I got it. The second gentleman gave me explicit detailed instructions of how many blocks to go, in which direction, where to turn and how to recognize it because of the gas station on the corner……., of which, I understood 100%. I was on my way. It’s great to have things like this happen as it makes up a bit for all the times I don’t understand most of what people say. As were returning from one of our exploration excursions, we stopped at one of the larger plazas at the mall that happens to be on our daily route. Cindy had seen some dancers that morning so it looked promising to see a show. Sure enough, at about 4pm a band came out for a set. I was surprised to see a harpist/vocalist leading a seasoned professional band playing Latin tunes. After their set, an emcee came out on stage to announce that the show would start at 5pm. What baffled us was the ensuing 3-4 dance groups who appeared to be prepping for the show in the most disorganized and undisciplined fashion possible. We were wondering if it was going to be worth waiting 45 minutes. The gig started promptly at 5pm when they brought out couple after couple of the most fabulous salsa dancers tearing up the dance floor with ferocious physicality. These young adults were in great shape. I gleaned from the emcee that many of these dancers had competed internationally. There were even a couple of dancers as young as perhaps 8 or 9 years old whose legs were spinning as fast as blades in a blender. What a treat to see such great local talent. I often thought of writing those words, though, it seemed we would find something completely different almost every time we’d crossed a border. 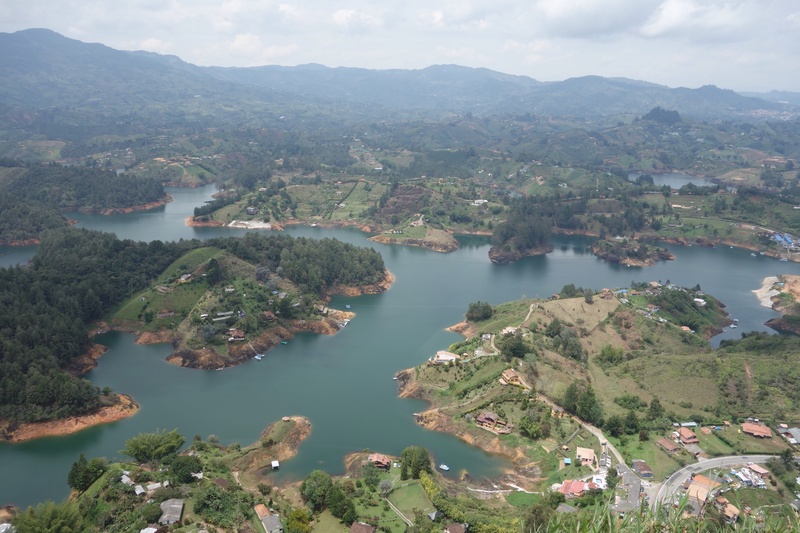 But now we’ve put a hold on rambling for another lifestyle, settling in with a wonderful host family in Medellin Columbia and returning to school to learn Spanish. This certainly is completely different. We even took on different names that are more phonetically appropriate since pronunciations are different in Spanish; Bill is usually, “Beel” and Cindy is, “Ceendy”. Here, they call us Chucho and Sofia. I’ve wanted to learn Spanish for a long time. Growing up in NYC I had many Latino friends and enjoyed living alongside the culture, the music and the language. We had family friends that were from Spain, too. 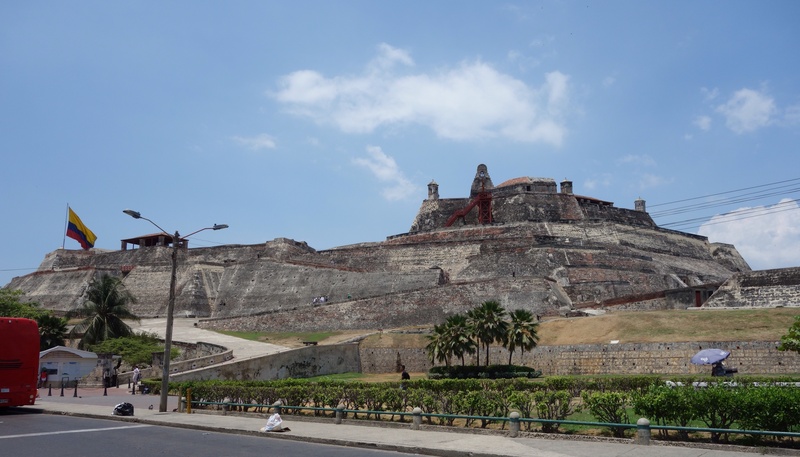 We’ve traveled to Latin American often and it’s so invitingly close for more trips, learning Spanish seemed like a useful, fun and interesting thing to do. 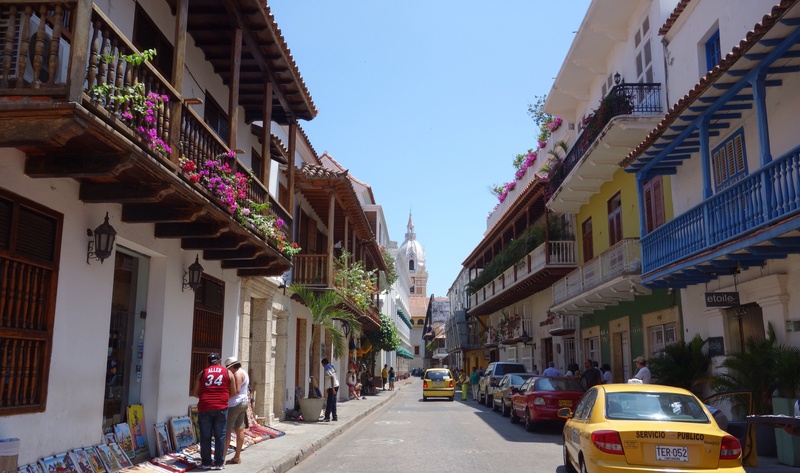 Colombia is proving an excellent place as the people are always appreciative when you try the native tongue and so very friendly and helpful in learning the language. 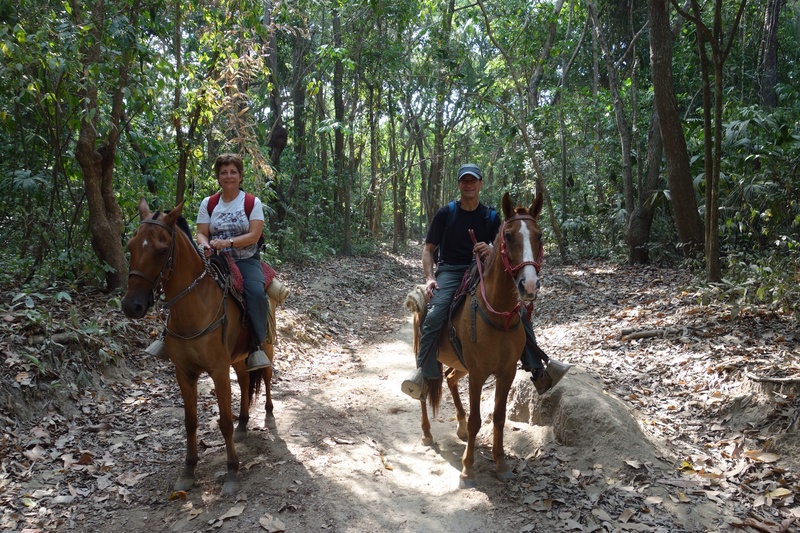 It’s a truly rich experience being immersed in another culture. And we’re loving that there are very few tourists. Our class time is pretty intensive. 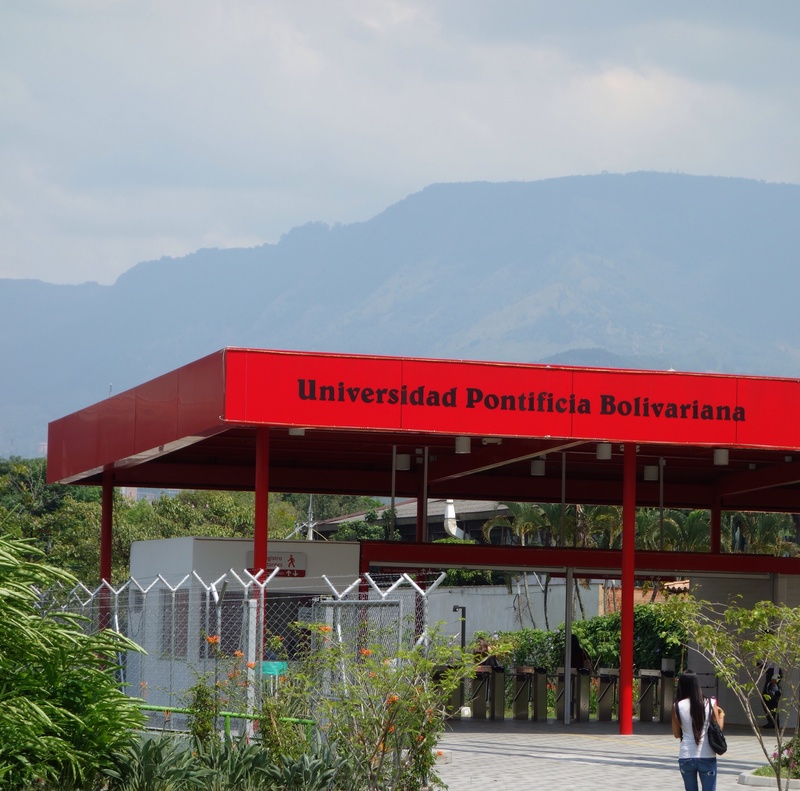 We’re attending Universidad Pontifica Bolivariana for 4 hours of daily class room instruction plus one hour of free grad-student-mediated club time (culture/grammar/conversation) about 3 times per week. It feels strange being back in school sitting at a desk, putting on the ol’ thinking cap and using whatever side of the brain language learning resides. Admittedly, learning the language is more challenging than I’d anticipated. There are so many ways to say so many things, irregular verbs, cognates, false-cognates….I wish I had done this when I went to school as a child. I find it fascinating that even though it has been over 40 years since 3 years of French instruction in school, I still understand quite a bit of it; far more than Spanish, but of course, that may be too much to expect for only 3 weeks of instruction. It’s strange how the mind works, especially when it comes to learning a foreign language. Reputations die hard, as is the case with Medellin. 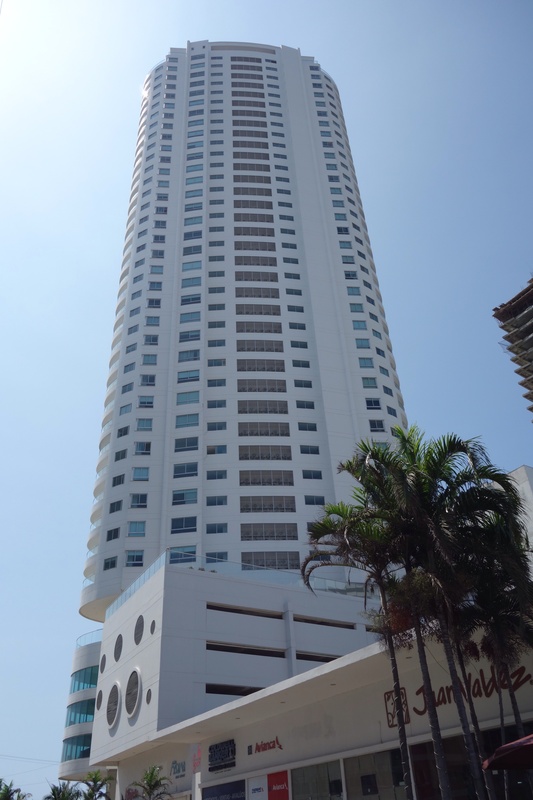 Aside from some hiccups, the city has been on the upswing since a roof-top chase ended in the death of Pablo Escobar in 1993. Ironically, that initiated the tempering of the city’s violent past, where today, Medellin is a modern, western-style world class city. Known as “The eternal city of spring”, it’s set deep into the gorgeous Aburra Valley with a micro climate that accounts for pleasant year-round temperatures. 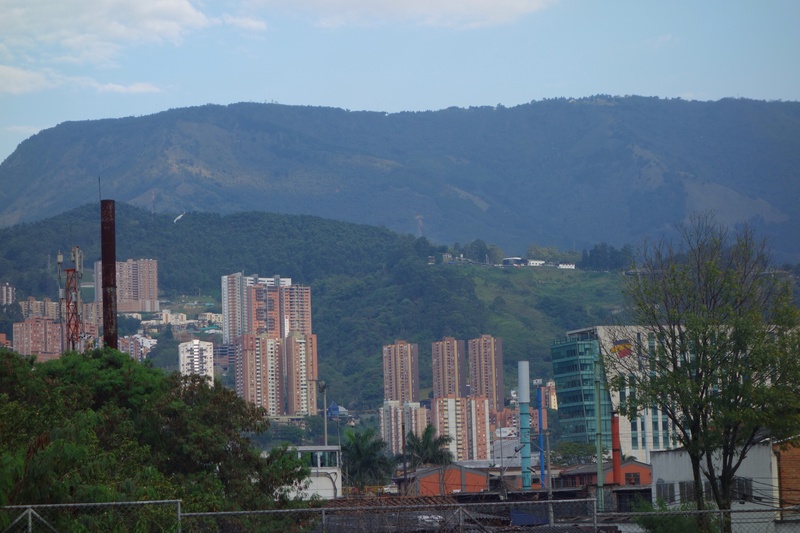 Looking up from almost any place in Medellin, it’s impossible not to notice the soaring mountains that cradle the city. This metropolis has an efficient, clean, secure metro, a cadre of inexpensive intra-city bus routes, a modern cable car system and potable tap water. It’s impossible to hold back when describing the friendly, helpful people who smile sweetly when you stumble your way through buying tickets or ordering food. 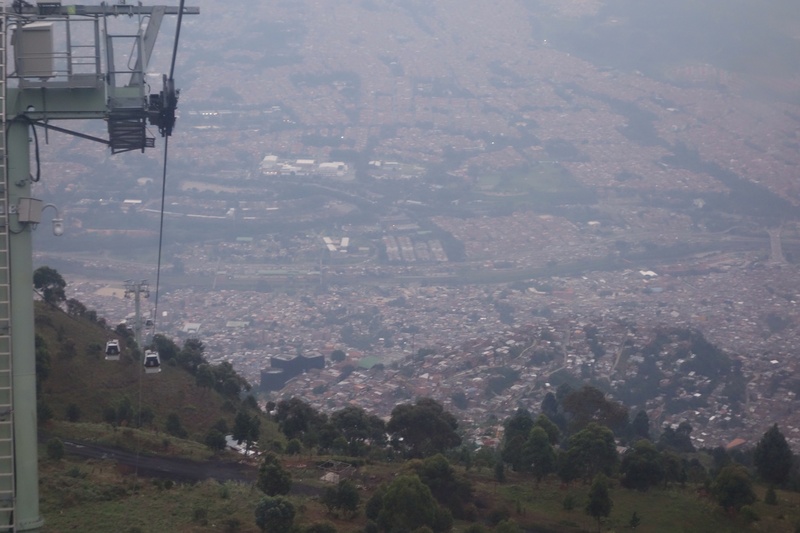 Medellin has even been written about positively in The New York Times and the Wall Street Journal. Still, “life in the big city” rules apply as caution is a daily watchword. 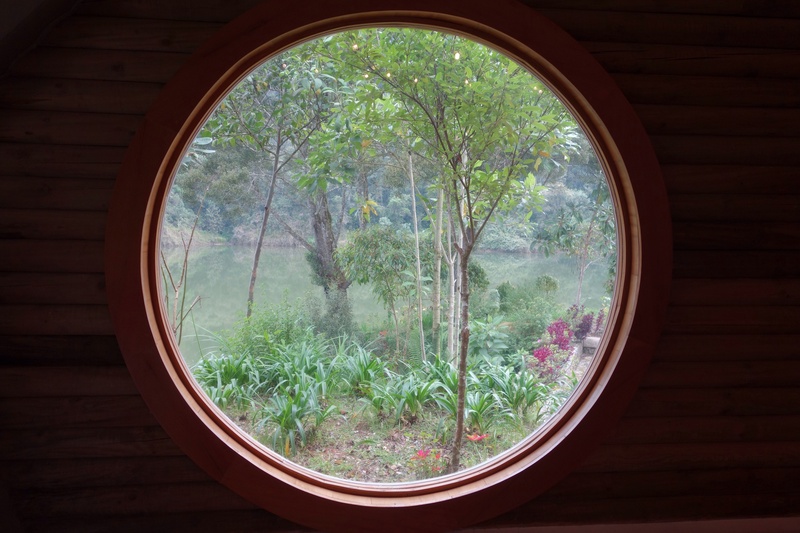 During our first free weekend in Medellin, we took a school field trip to Parque Arvi, an ecological reserve set high in the mountains above the eastern slope of the Aburra Valley. We started with an easy to navigate public metro system which took us right to the metrocable. 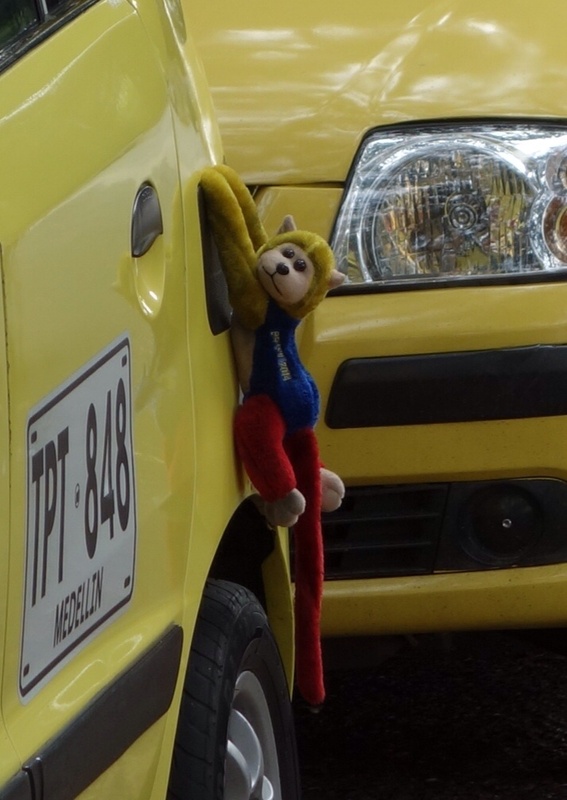 And then a chiva took us to the park entrance…. 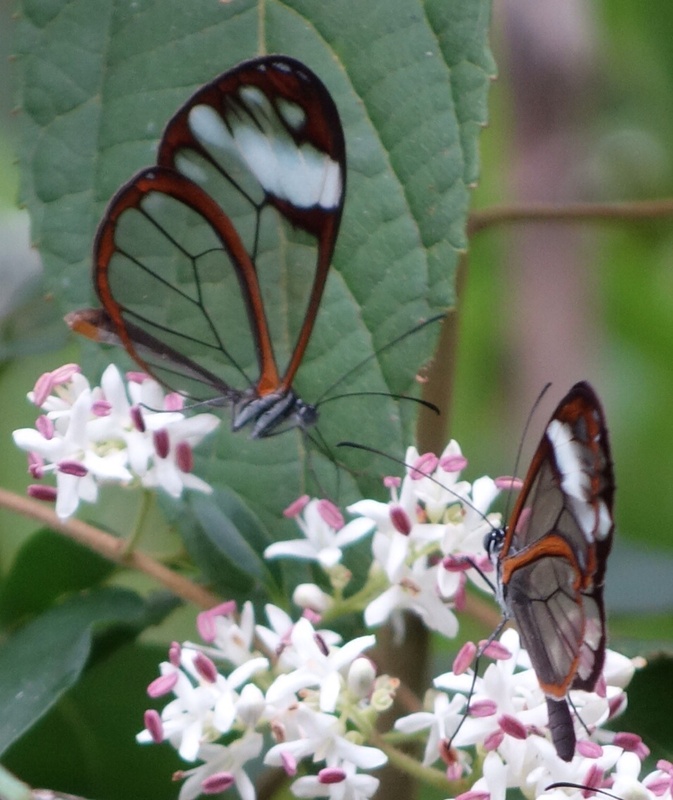 We toured the insect and butterfly houses in the reserve. Pearl Harbor is close to the airport so we decided to tour it just after we landed and picked up our rental car. 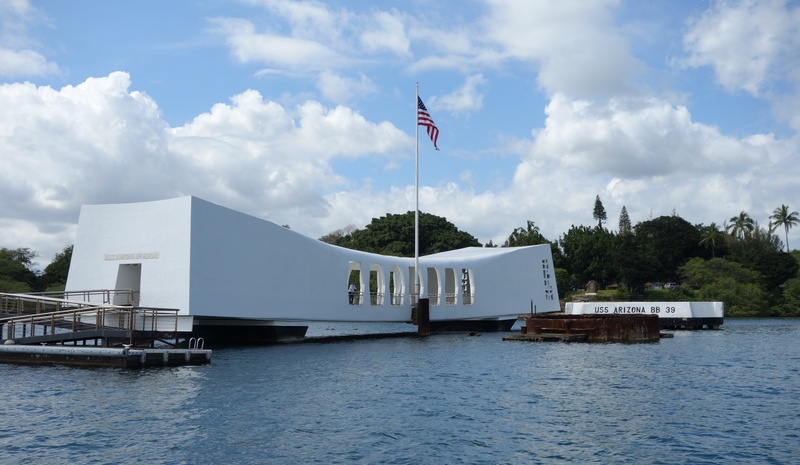 Valor in the Pacific National Park is an extremely well done park containing artifacts and thorough explanations of local and world events that occurred before, during and after the attack. The exhibits didn’t appear to whitewash any historical facts including the racist internment of loyal American citizens of Japanese descent. 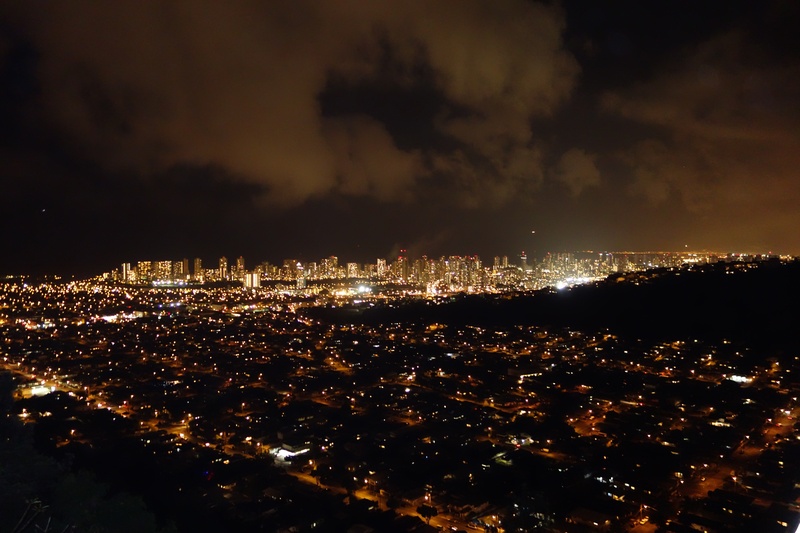 Our digs on Oahu were perched high above the city with an amazing view of downtown as well as Diamond Head. We savored our terrific night-time views as well. 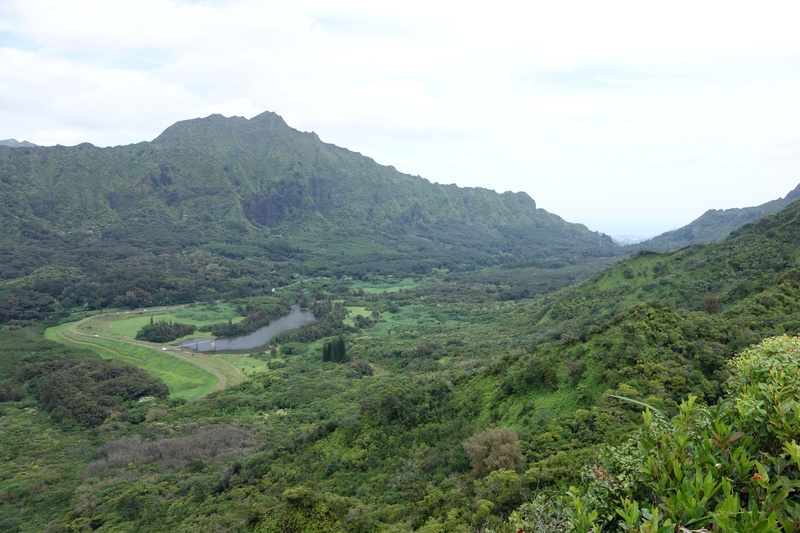 Oahu is the most populous island. 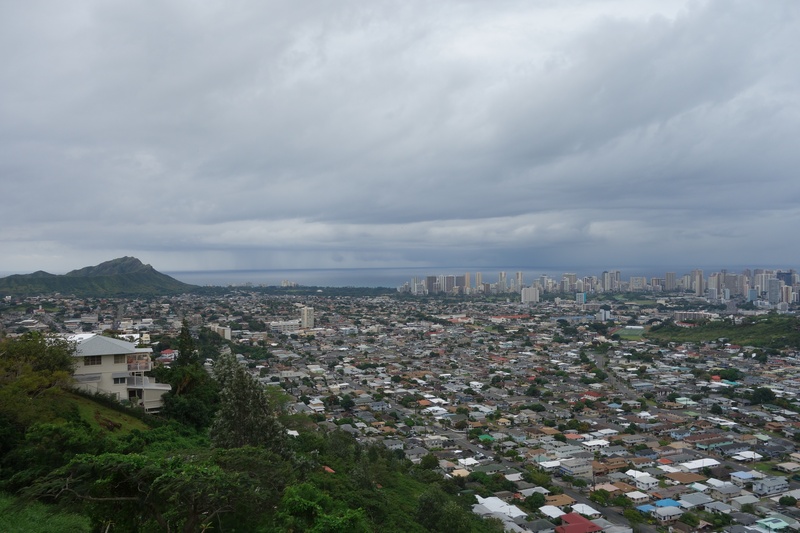 On it resides Honolulu, Hawaii’s capital and its most populated city; a vibrant metropolis replete with rush hour traffic and an occasional aggressive driver. None of this detracted from the stunning beauty of this tropical paradise island. Topographically, it is dominated by two volcanic mountain chains that run parallel along the northwest orientation of the tectonic plate’s path, an alluvial plain saddled in between. The iconic Diamond Head, symbol of Hawaii and Waikiki beach, turned out to be a big surprise. It’s actually a crater of a dormant volcano. View from the top of Diamond Head. To get to the summit requires driving through a tunnel in the side of the crater and parking in the caldera. 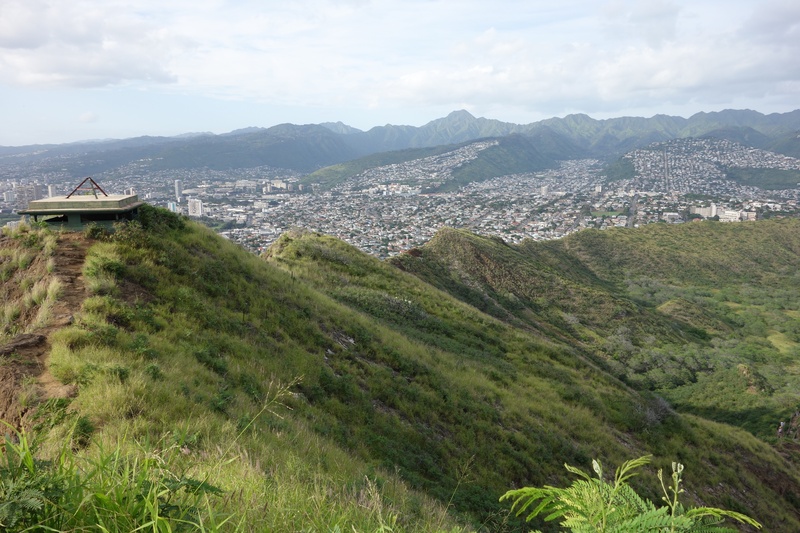 The hike goes up the inside of the highest point of the crater which, from the outside, makes up the famous image seen from Honolulu’s Waikiki Beach. Being back in the US meant some comfortability in being a citizen and knowing the lay and law of the land. But I recognized some things that I was uncomfortable with, as well. Public restrooms are typically dirty and not well maintained. If there is toilet paper in the restroom, it may be as trash strewn across the floor; and the seats are often very dirty. While driving on the road, there are scenic outlooks with a chance to pull over and stop but despite an abundance of fantastic scenery, I sometimes found that I’d pulled off the highway to find an obstructed view or a scene that was just not that pretty. States like Hawaii draw a lot of people who move there for the wonderful weather and then find that it’s incredibly difficult to make a living wage. 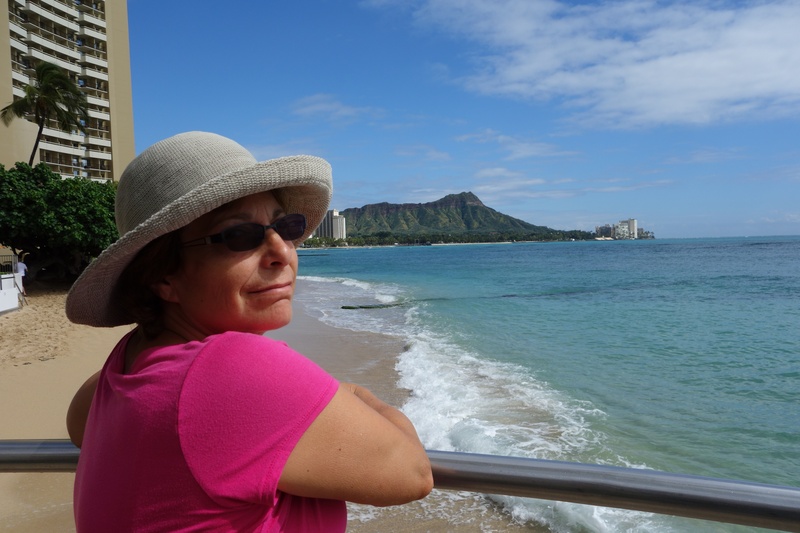 Only hundreds of yards from stores like Louis Vuitton and Coach sits Waikiki Beach where there are people who set up mattresses to sleep at nighttime. Near the same spot on Waikiki, I saw a guy pull an ice cream cup out of the garbage, look inside, take a whiff and then start eating what was left over. The ice cream cup probably smelled better than him. To be fair, comparisons only make sense in the context of other developed western nations so these were my points of reference or comparison as I returned home. 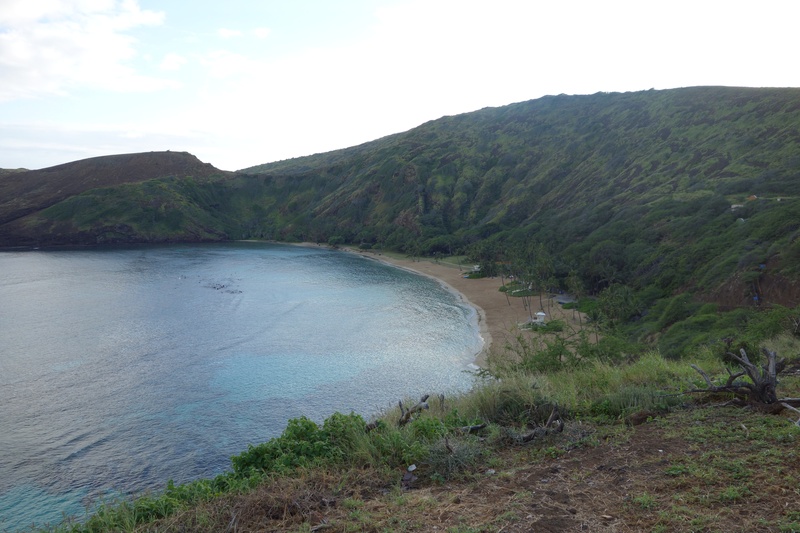 Hanauma Bay is without question the premier place to snorkel on Oahu. 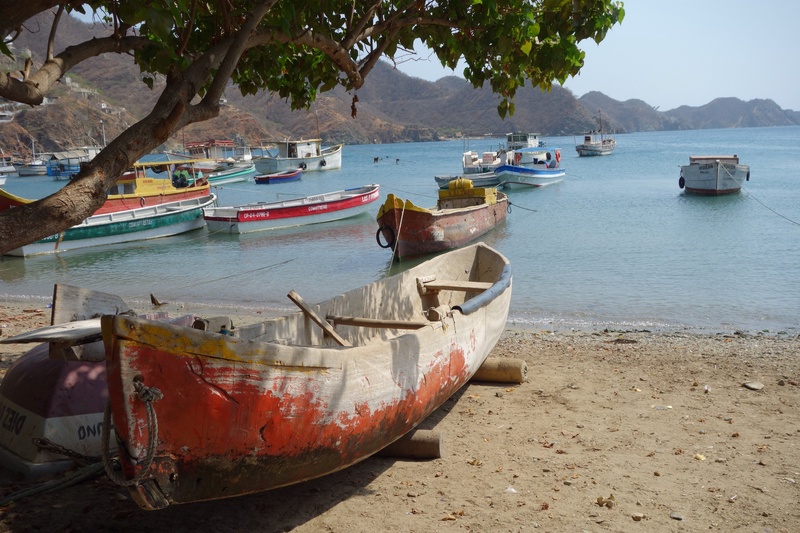 The bay features a beautiful white sand beach and a reef filled with one of the most diverse environments. It was also a volcano tens of thousands of years ago, the southeast wall eroding over time thereby creating the bay. 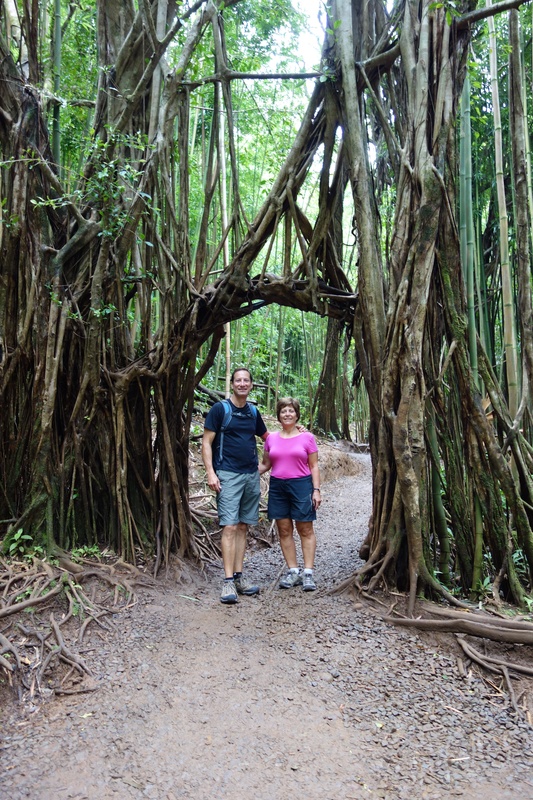 We went for a hike to Manoa Falls. It was unexpectedly crowded perhaps because it was one of President Obama’s favorite hikes when he lived there. After we reaching the falls we continued on another trail which took us up to a ridge where we were able to catch a great view. There’s political tension I noticed while on the Big Island. Hawaii was an internationally recognized monarchy until deposed by a coup that was engineered by American business interests and backed by the American government in 1893. This led to the annexation of Hawaii five years later and statehood in 1959. (I think it can be said that the natives were royally screwed–or screwed royalty). There is a faction of Hawaiians who want this reversed, though, unlike their New Zealand Maori cousins, there is no consensus or even much political agreement within the native community to move with solidarity. I was surprised to learn that Hawaiians don’t possess the same status as Native Americans. This is at least a partial result of enough Hawaiians not thinking of themselves as Americans but rather descendents of the former monarchy. Perhaps this is also complicated by the lack of documented blood lines and contributed by the historical decimation of about 90% of the original Hawaiian population by diseases brought by foreigners. 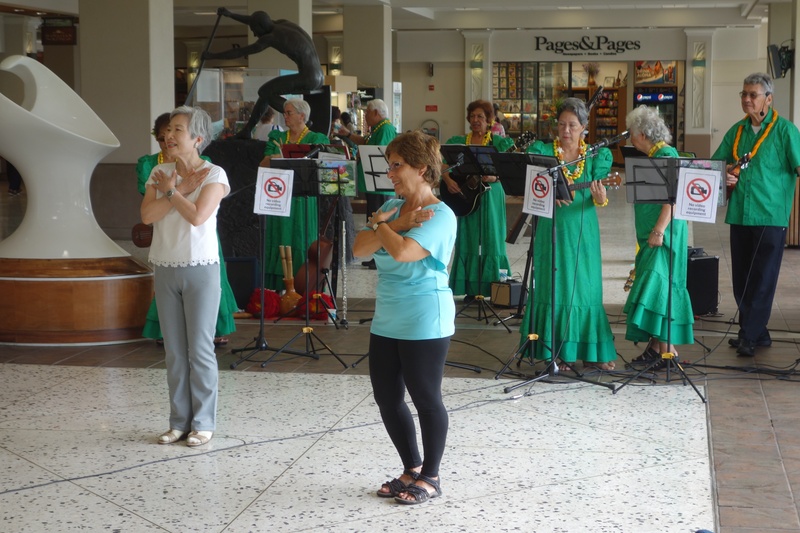 There is a spirit in Hawaii that generates a truly exceptional friendliness: the Aloha spirit. It is one of the things that makes Hawaii so special. The most common meanings of Aloha are a greeting, a farewell or a salutation. It’s also commonly used to mean love. Literally, it means “divine breath” and is an acknowledgment of a divine presence that resides inside and outside of people. We planned our trip so that it was flexible enough to come and go when we felt like we were ready. That wasn’t always possible and we left Hawaii wishing we’d spent more time there. 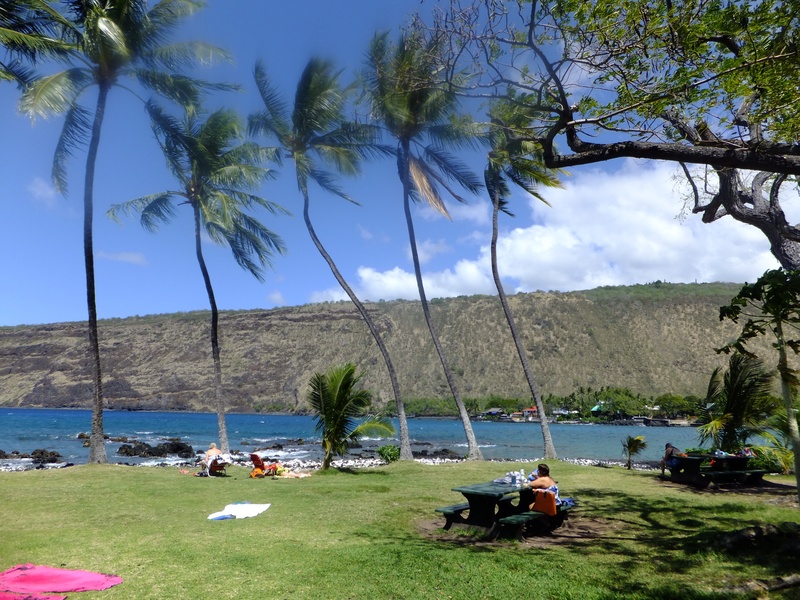 We spent two weeks on Hawaii, The Big Island, called so because it is so. We spent a fair amount of time in the car trying to see and do as much as possible. One of activities that caught a lot of our time and attention was snorkeling. We were prepared for this as the only extra ‘luxury’ items we brought with us were snorkel and mask. It really paid off here since there were so many wonderful snorkeling sights and we didn’t have to worry about renting and proper sizing. 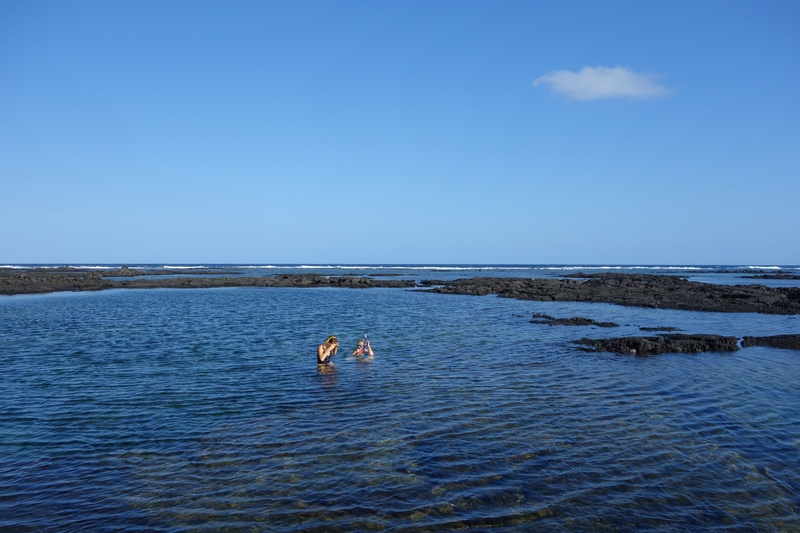 We went to the Kopoho tide pools twice. It was difficult to maneuver around some of the shallow areas so we made sure our return trip was at high tide. Still, at one point I was about to skim over a shallow area and noticed a juvenile spotted moray eel in front of me just in time to put the brakes on. It probably would have sunk back in its crack but they look so fearsome, I chose to swim around it. At Manini Beach I spotted an octopus as we were returning to shore. What a treat! They are one of the most interesting creatures as they can change color and texture instantaneously. 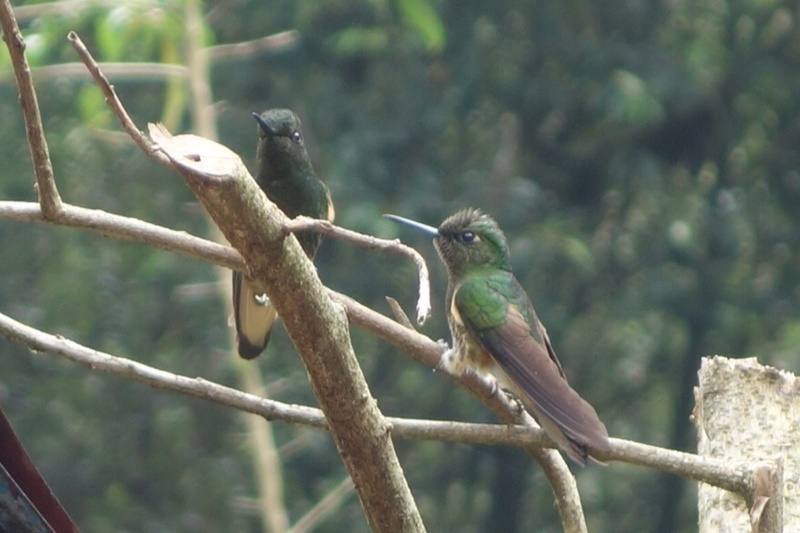 We watched it for about 5-10 minutes hovering far enough away so it wasn’t spooked by us. 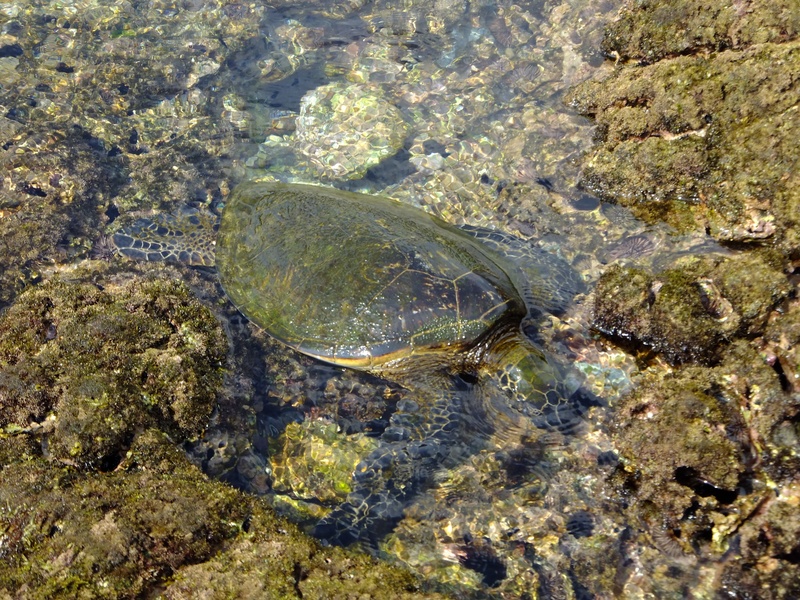 Hawaii has a lot of green sea turtles. 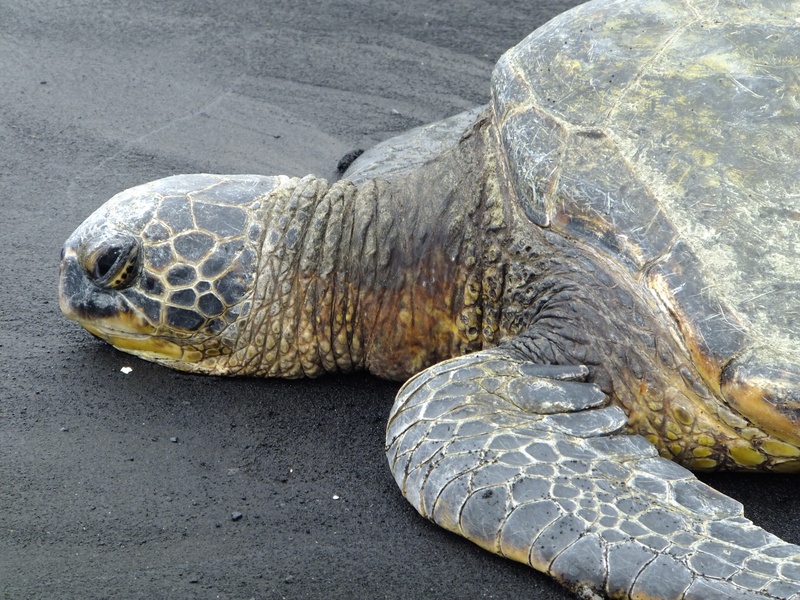 Black Sand Beach/Punalu’u, is one of the best places to see them on land as well as in the water. It’s beautiful to watch them swim so gracefully, not caring the least about the presence of humans. I’m told by locals that they were not so common years ago (turtle soup was a delicacy) but now they’re protected and abundant in numbers. South Point is the southern most point in the U.S.A.. 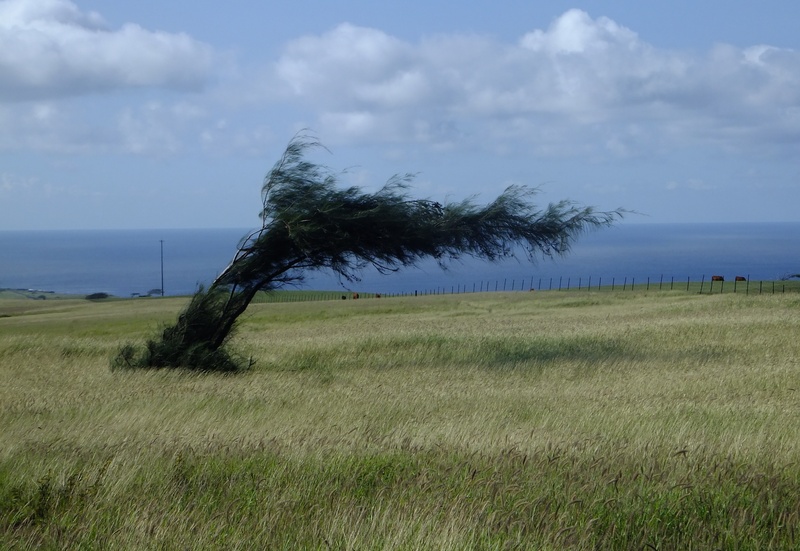 Essentially, a very windy plateau that ends at dramatic cliffs which drop off into the deep turquoise ocean below. 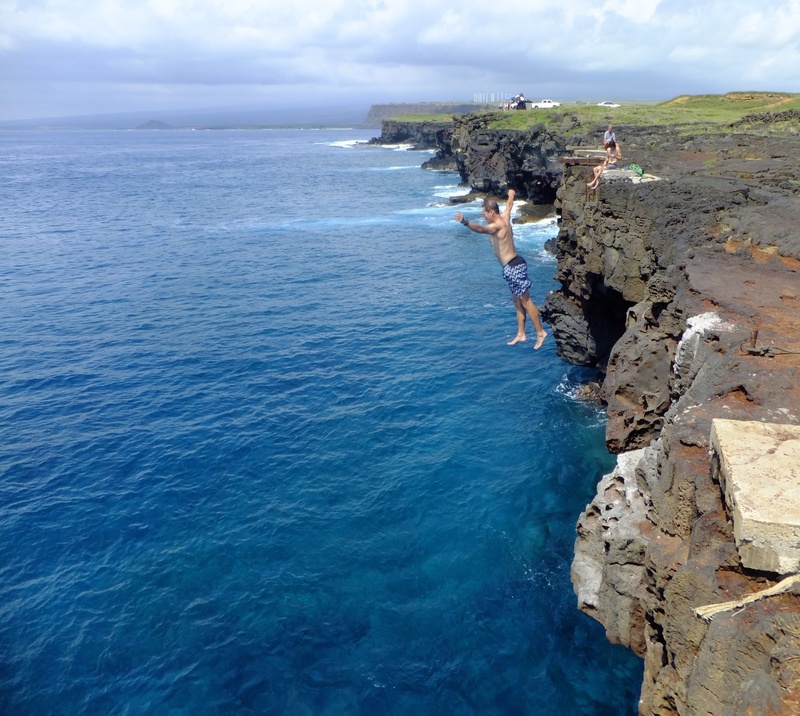 It is also a very cool place to jump off a 25-30 foot cliff into beautiful turquoise water. 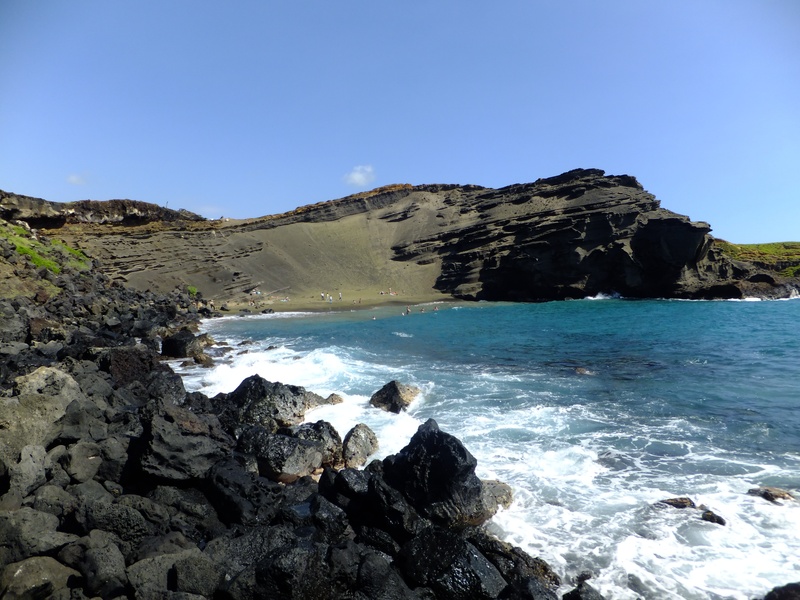 From South Point, there was a hike across golden brown sands and jeep tracks to a gem of The Big Island: Green Sand Beach. Before being abolished in the early 19th century, Hawaii had many sacred societal Kapus or taboos such as men and women not being allowed to dine together. Violating Kapu meant an immediate death sentence. 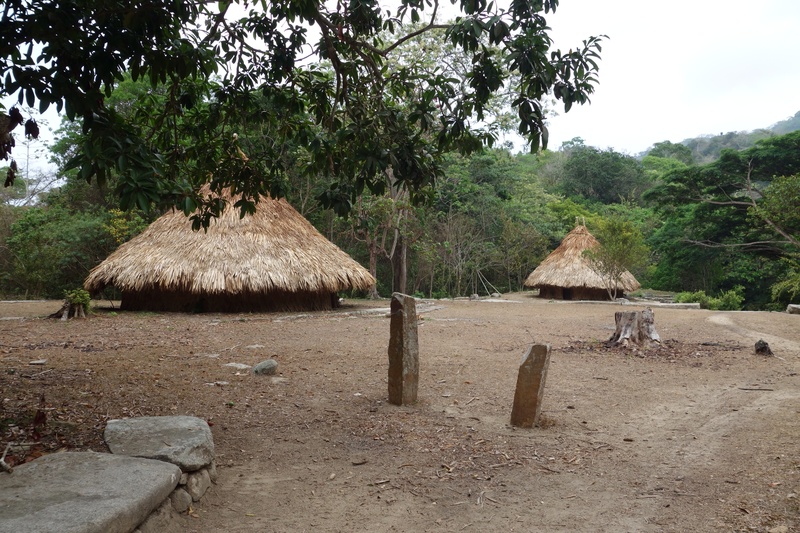 But around the islands there were “Places of Refuge”, where, if you could out-run warriors and swim to a place of refuge, you could be blessed by a shaman and eventually return home. 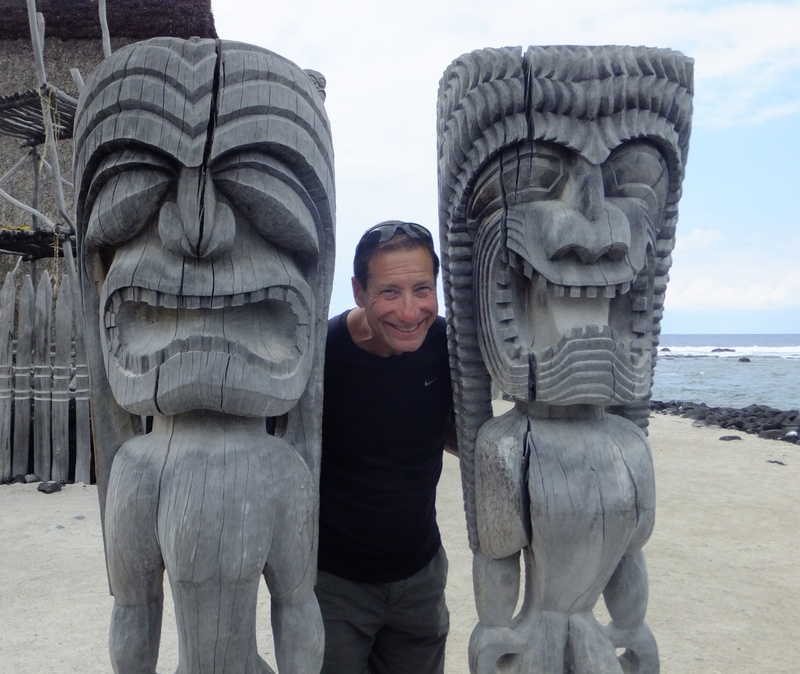 Pu’uhonua was one of those places. It was a very difficult task to make it to a place of refuge. Of course, if you did get there it wasn’t a good idea to taunt the warriors who had been chasing you. 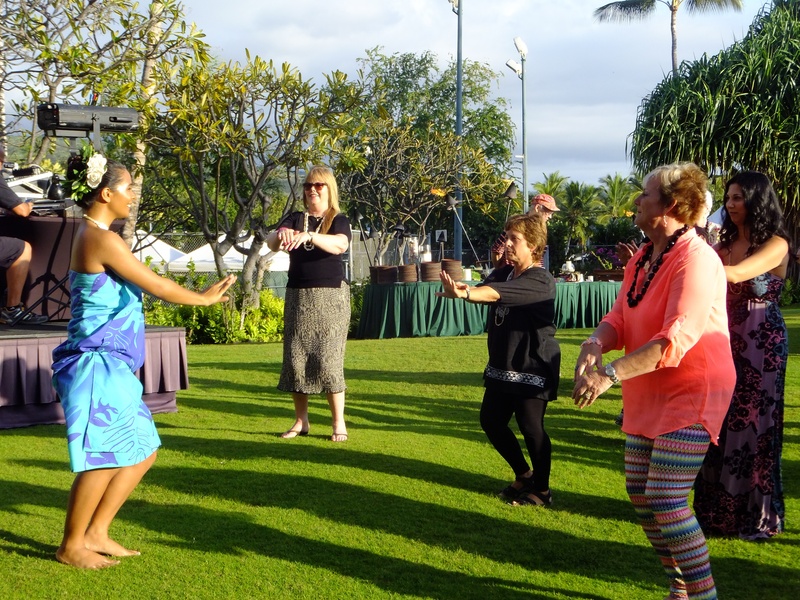 We attended a traditional (read: tourist) Hawaiian Luau. 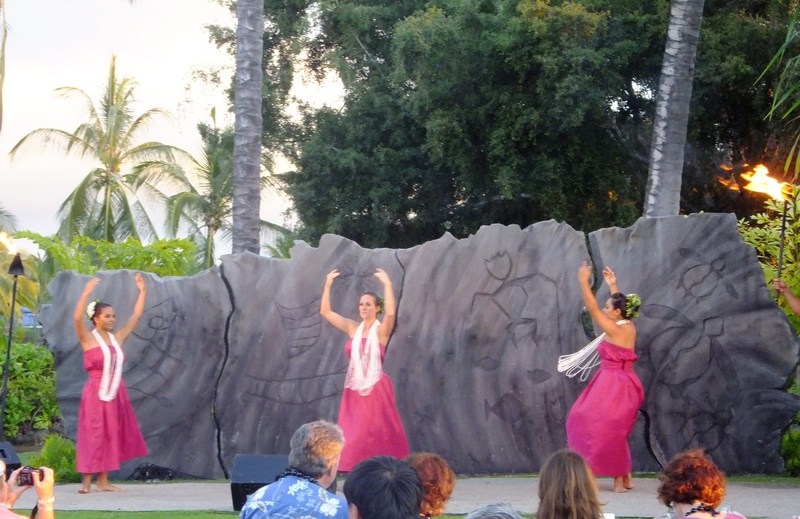 We saw a variety of Hawaiian dances in addition to some from other countries where Polynesians migrated like Samoa and New Zealand. Cindy learns the hula. Go Cindy! While at the luau, we saw whales off shore in the distance.